The real reason for Colombia Moda isn’t just for people like me to gawk at the clothes and take pictures of models. It’s to promote Colombian textile and fashion internationally. The worst thing about Danville’s woes; we aren’t alone – skilled manufacturing jobs have disappeared from the American landscape, leaving unemployment, poverty and hardship in its wake. How does this relate to Colombia Moda? In addition to showcasing home-grown talent and fashion, much of the focus of Colombia Moda’s lecture series this year has been on ‘re-shoring‘ or bringing clothing production back to the Americas. So with this background in mind – I set off to interview some of the smaller Colombian companies. I didn’t look for GlobalTex – Walberth Montoya of GlobalTex struck up a conversation with me as I walked out of the administrative offices of Colombia Moda with my new press pass around my neck. 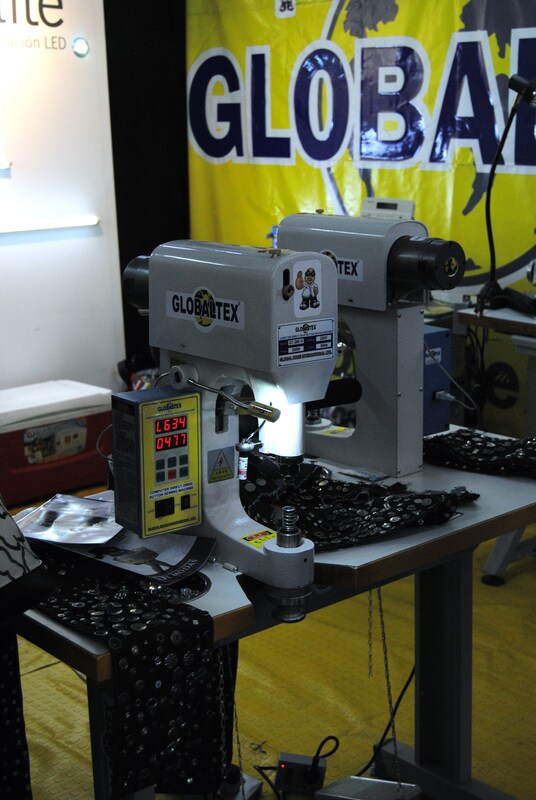 Secondly, GlobalTex isn’t technically a Colombian product – it’s a Chinese one, with offices in Bogotá, Colombia. 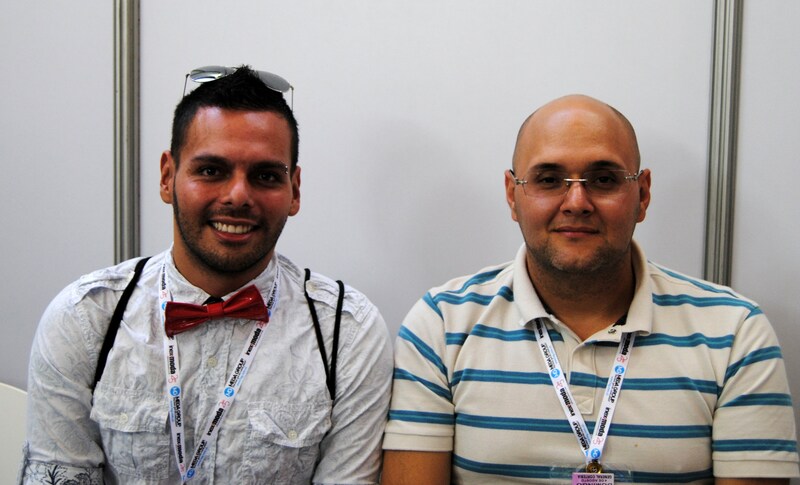 But these distinctions fall to the side – after talking to both Sr. Montoyan and Ronald Frajales Bedoya of Psique. GlobalTex is an industrial equipment company that supplies irons, sewing machines and all of the other machinery used for clothing manufacture. This equipment is imported from China, but differs distinctly from other industrial sewing machines (etc) in that it has been specially designed for use by disabled people. Sewing machines for example are set into tables designed to be wider than normal, and the proper height, with easy to reach instruments for people in wheelchairs or otherwise limited mobility. The foot pedals have been replaced with just a few buttons and knobs. As industrial machines, the y have already been streamlined (so there aren’t fifty stitch options like the average home sewer.) This makes the machinery easy to use even with people with learning disabilities, or emotional/ mental limitations. Other machinery has been adapted for use by people missing fingers or even arms or other disabilities. This is particularly important in a region like Colombia that suffers from a devastating civil war that disproportionately affects the poorer residents, as well as limited pre-natal and post-natal services for any of the poorer or more rural areas of the country. 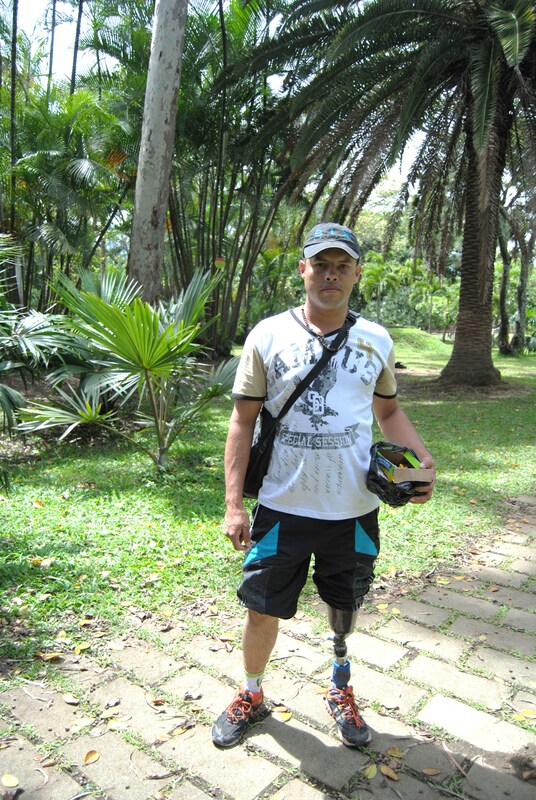 GlobalTex has partnered with the Psique Fundacion, which is an organization dedicated to assisting people with chronic illnesses or disability to lead full and normal lives. The organization helps disabled people find resources, gain access to rehabilitative therapies and to join the workforce as productive and self-sufficient members of society. This may not sound like a big thing – but in a moderate sized nation like Colombia with a vast gulf between rich and poor, the social network for supporting people with disabilities or mental illness is not as comprehensive as some nations. Even in the USA, where depending on your political leanings, disability services such as social security/ ‘workfare’ etc. are polarized into being either critically insufficient or unnecessary, wasteful spending, programs similar to this one are essential for the emotional well-being of this vulnerable population. GlobalTex (and Psique), in turn can supply much of the equipment and labor force for other Colombian companies in the textile industry. Drews is an exclusively male line of underwear. This Medellin-based company by the designer who goes simply by Drew, prides itself on the innovative and elegance of their pieces. The designer explained that it is the characteristic seaming of the garments which give each piece its support, and comfort while being an attractive option for consumers. The company is coming up on its fourteenth year – and as it looks to expand its brand to overseas markets – it’s 100% Colombian made. All of the designs, the models, and all of the clothing, even the fabric itself is made in Colombia, right here in Medellin. Tentacion is a three-year old Medellin company founded by Luis Alejandro Diaz Rua. Prior to his foray into fashion, Sr. Diaz reports that he did a wide variety of jobs to make ends meet, including at one point, selling couches and housewares. He reports that his inspiration for the creation of the lingerie, swimwear and fitness line was his mother, and his female friends. It was based on their conversations regarding the lack of moderately priced lingerie. (Lingerie by the popular lines like Leonisa are quite pricey here). He also reported that women were seeking sexier, glamorous yet comfortable options. Like Drew, Tentacion is entirely a Colombian operation, from the designers, models and garment construction, complete with the use of Colombian fabrics. I wish all three of these companies the best of luck – and hope that American companies can find inspiration to revitalize our own industry at home. “Follow your labels” – a series by Kelsey Timmerman at the Christian Science Monitor that follows overseas garment construction. DAV – Disabled American Veterans – to help people at home. Poverty in America series – NBC written series on the growing poverty in the USA, and lack of hope for future employment. I had hoped to publish this, along with a series of articles over at Examiner.com – but the administrators tell me there is little interest in anything Colombian. I beg to differ, which is why I am publishing it here – even if it differs from our usual medical topics, so please let me know if you enjoy these glimpses into Colombian life. This entry was posted in Colombia, Stories from the Front and tagged Colombia Moda 2013, Colombian companies, Colombian made garments, Drews male, GlobalTex, helping disabled people live full productive lives, in-sourcing, lingerie, Luis Alejandro Diaz, Matt Rines photographer, Medellin-based textiles, re-shoring the garment industry to the Americas, Rua, Tentacion. Bookmark the permalink.